We celebrated Thanksgiving on Sunday in Canada and because of that I have a lot of turkey leftovers. 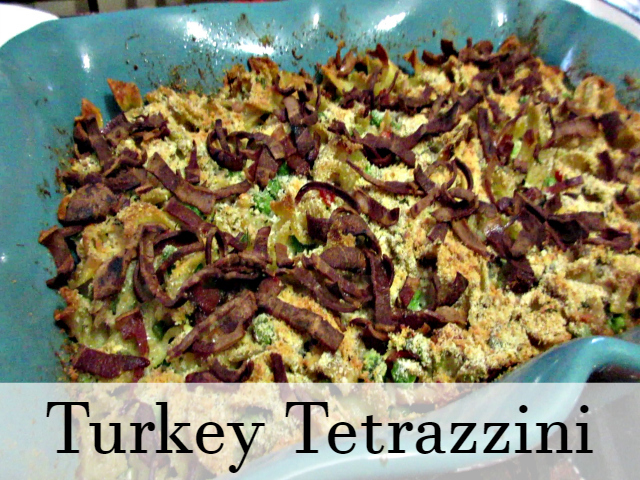 There is no better way to use up my turkey leftovers than our family favourite Turkey Tetrazzini. Shopease Foods provided the 17lb Turkey for our Thanksgiving and I have a video on YouTube on how we did our turkey in our roaster last year and we did it the same way this year but you can view the video here. Time to get on with my Tetrazzini recipe now. Boil water to cook pasta as per package instructions. Once cooked add in 2 tsp of butter and put noodles in prepared casserole dish. In a heated frying pan cook bacon. Transfer bacon to plate once cooked. In the same frying pan cook onion, red and green pepper and celery. Saute until done. Transfer to another plate. Melt butter in pan and add flour, salt and pepper until thickened. Add broth gradually keep stirring so there are no lumps. Once thickened add in green pepper mixture, peas and turkey. Once combined spoon over noodles. Tops with breadcrumbs, parmesan cheese and bacon. Bake for 25 to 30 minutes and serve! How do you like to use up your Turkey leftovers?